De Bedstee Hotel is in the travel directory for cat's lovers! - De Bedstee Capsule Hotel- Official site-Best prices. This is a love story featuring De Bedstee Hotel In Amsterdam and their beautiful calico Madonna. This is the kind of story that makes our hearts purr with pride! Two years ago, Madonna was wandering the streets alone and came every day to visit the reception at De Bedstee, a unique Dutch capsule hotel in the heart of Amsterdam. After watching her for a while, the owners realized she was visiting from the cafe across the road. The cafe management told them her story; that her previous owner had abandoned her in the cafe after seven years. Madonna was desperately looking for a family and did not enjoy the busy cafe life. After a few months visiting De Bedstee, together with the cafe management they all decided Madonna should pick where she liked the most to live. She picked De Bedstee for her forever home. And that’s how she officially became a resident cat. Madonna is a calm and assertive kitty who has adjusted well to the role of feline in charge. She loves people and attention and is known to go crazy for a brush. Since moving in, she’s expanded her kitty tribe with a best friend Guus, a tiger cat from the neighbourhood and a girlfriend called Molly, whom she chases in the garden. In summer, you might spy her sunbathing, or watching the Amsterdam goings on from the window, one of the best vantage points in town. De Bedstee Hotel offers tiny and beautiful spaces with big value for travellers, through their vintage style capsule rooms in the heart of Amsterdam. The rooms are comfortable and cosy, including authentic Dutch beds with luxury mattresses and a media panel. The property features vegetarian and vegan breakfast (thumbs up from us! ), an onsite-bar and storage facilities. Guests can choose from a buffet breakfast or à la carte. Included in the price of your room: love and cuddles from Madonna. Amsterdam is a unique city rich with history and art and is just beautiful to walk around in for days on end. Visit for: Ann Frank’s House, Van Gogh Museum, Rembrandt Museum and more. Besides snugging Madonna, you can also add more cat adventures to your itinerary, there’s the Katten Kabinet Museum (art collection full of cat art) and The CatBoat, a floating cat Sanctuary, where cats are always in need of an international cuddle. De Bed Stee Hotel is located at Jan willem Brouwersstraat 25 , Amsterdam. Double capsules are around $200 AUD per night. Please check the current rates for this property direct via their website. Images and information thanks to De Bedstee Hotel. 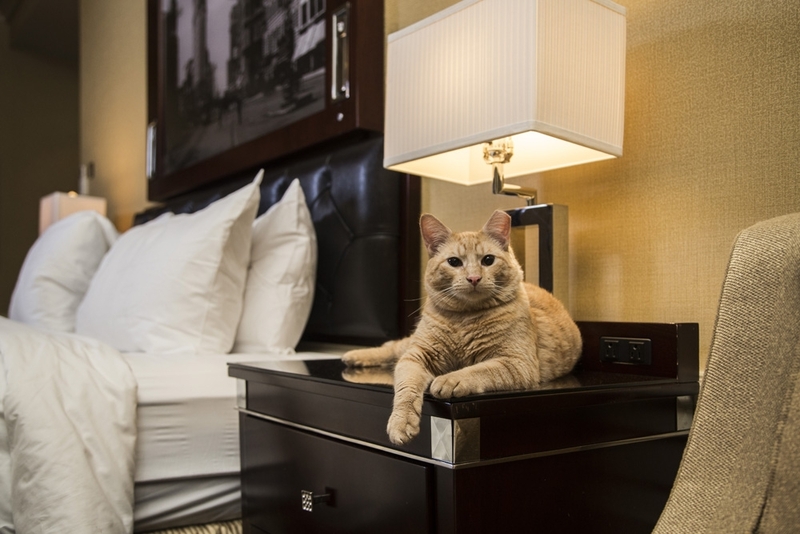 Hotels With Cats is the world’s first travel directory for cat lovers! 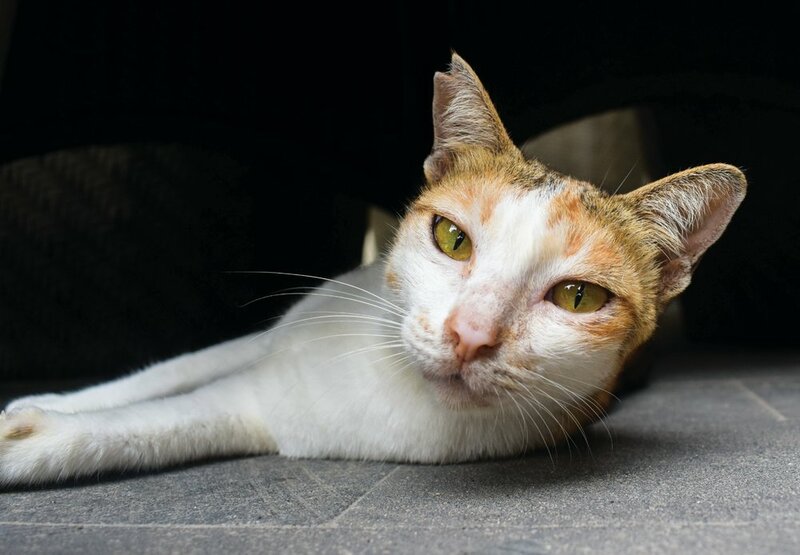 We help you find cats wherever you are while showing the world that kindness to cats is good for business. We recently launched our annual magazine full of 54 pages of cat travel goodness where Madonna is the cover model! CHECK OUT OUR MAGAZINE HERE. Coming soon! Bubbles and James from Pesona Beach Resort and Spa Gili Trawangan, Lombok.